Yes it's already getting on my nerve, I will order the Sicce Syncra first thing tomorrow morning. I will probably return my life rock from Carib Sea as well, the pieces are just to darn big for this tank. Take a look at the picture below, my other three pieces are useless to me as they just don't fit. I have mine in my room as well. It is across my room but loud enough to where it bugs me sometimes. Is that Sicce Syncra suppose to be nice, this is my first rodeo with salt water aquariums. I need a nice quiet return pump. My new tank shrimp is super cool, he offers free daily hand cleanings. A rare glimpse of my blue hermit crab. He is really small and is constantly moving through out the tank. So this is my first update of being 19 years old and also from the new laptop I got for my birthday! So today I visited North Canton in Ohio. I went there to find Ocean Rift aquarium store. The moment I walked into the store I knew this would be where I would do all of my tank purchases from now on. This place was super cool and very clean. The owner was extremely friendly and was an awesome guy. This place had some of the coolest display tanks I've ever seen. Alright onto my tank. Tomorrow I will be doing a water change. I cleaned the inside and outside of my tank tonight. My blue chromis and cleaner shrimp seem to be doing amazing. I am still in the hunt for some trochus and nassarius snails. I am also looking for somewhere to trade in my peppermint shrimp and two Astraea snails. I might be turning in one of my Mexican turbo snails just based off of some info ive gotten from here. Tomorrow marks the big challenge. I leave for vacation tomorrow and I will not be home until june 9th afternoon. I have a friend that has some knowledge of aquariums. He will be feeding my tank once in morning and once at night. 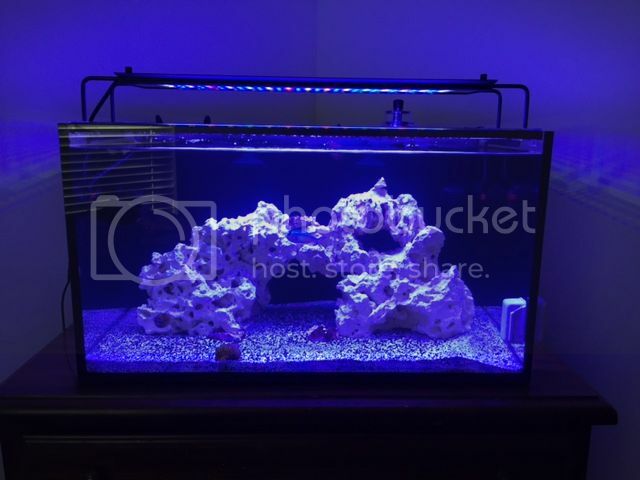 My aquamaxx nemolight will also be coming in next Wednesday. 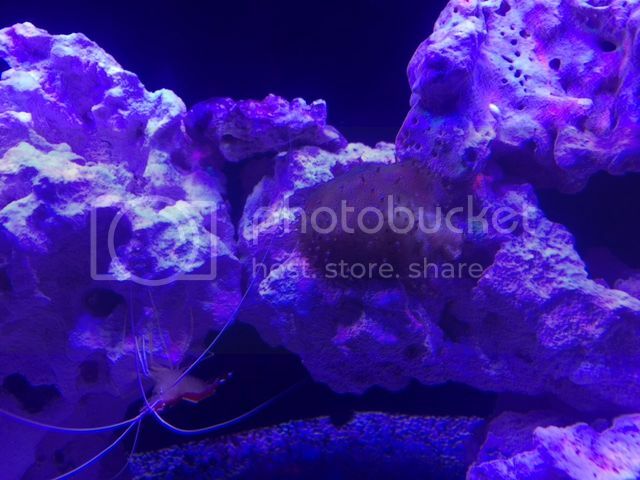 fingers crossed everything will be perfect when I get back if so I will be getting a clownfish and maybe a kenya tree frag a few days after getting back. Please keep up with the advice and opinions. The information you guys are giving me is awesome. Please feel free to ask any questions! Personally I wouldn't recommend you to put a Kenya tree or xenia. They are good corals for beginners but they will not stop growing and reproducing. When I got into the hobby I had ordered a xenia frag, within a couple of months it had invated and spread all over my fish tank. Since then I call them "weeds" lol. But that's just my opinion. Kenya trees don't grow as prolifically or as problematically as xenia. Xenia are tough becasue they walk around the tank when expanding, and even when you cut them, the part you cut and any flesh left on the rock will grow back to full pieces. Kenya trees grow slower, and when you pull the pieces from the rock, they don't leave any flesh behind, and are easy to keep track of becasue they don't walk. They only become problematic and drop new offspring when they're huge. I used to have one the size of a basketball when fully inflated, and it would drop new pieces every few days, but they were easy to corral into a frag box and sell. Still a fun easy coral to get started with, and much more tolerant than LPS. I have heard great things about it but never heard one in action. I made some update to my rock. That actually sounds really fun haha, I will most likely get a kenya frag and a torch frag. I think I am getting a clownfish as well. Marine depot has them in stock right now. They don't have many left but I'm sure they will get more if they sell out again. Sorry guys for not posting lately its a been a crazy week and a half. between a catfishing trip to Cincinnati, vacation to Orlando, and then a zoo trip to the Columbus zoo I am tired. It was nice to come to home to a stable tank. I came home with this being delivered to my house two days before I got back! 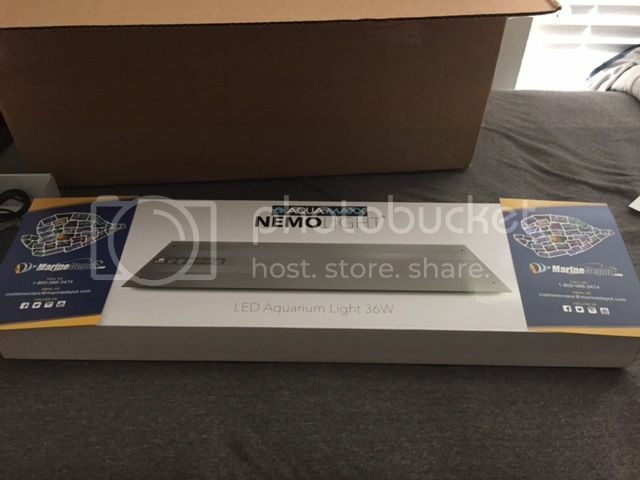 I got the AquaMaxx nemolight from Marine Depot. I am very pleased with this purchase and I cant wait to program sunrise and sunset schedule. 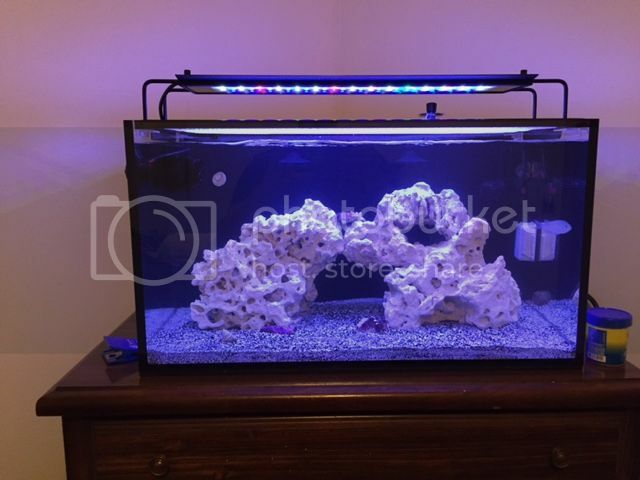 This is what the tank looks like with the blue channel option on the nemolight. This is also what my tank looked like after not being with it for a week. This picture was taken tonight, this is the white channel option on the nemolight. Did some tank maintenance and got things looking back to normal. My tank is done cycling and I am very excited to be adding some new members. I started this week by visiting rivers to reefs in Columbus. I was only there for 20 minutes. In those 20 minutes I was blown away with how nice this LFS was compared to what I have seen. There display tanks were very nice and looked awesome. They also had a very nice and extensive display of corals. I am looking to get rid of one of my two Mexican turbo snails and I am also looking to trade my two Astraea snails in for two trochus snails. I also added two Nassaruis snails tonight. Tomorrow I am visiting a place in North Canton, Ohio called Ocean Rift aquarium. I went there a few weeks back and it was really awesome. I am going to pick up a species of clownfish along with a kenya tree frag. How do you like the light so far? Definitely get some of that frogspawn. My tank is almost all softies and it is probably my favorite. I like the light a lot it is very slim and sleek. It gives me and my tank kind of a professional feel because its so nice. The only problem I have with the light is not the lights fault haha. I need to get up at 8am or 9am to begin timer mode for sunrise/sunset schedule and that is pretty early for me. frogspawn? I will have to check it out when I go to the LFS today. This photo was taken during acclimation. I drip acclimated my new tank mates for 45 minutes. My new tank mates include a clownfish, green bubble anemone and a leather coral. Yes the anemone looks huge, when I was picking out which one I wanted they told me the two in the corner was two. I said just give me one of those. Well as they were pulling it off the glass the "two" stayed together. The LFS said it was splitting and gave it to me for the same price as one. This is the photo of the new leather coral I got from LFS. I am not sure how I feel about this coral yet. I had one of the workers with me and I pointed to a coral in the display tank and asked if they had any frags similar to it. The one in the display tank was brown and green, the one I received is brown bottom and a brown top. I thought the green one looked cool and I'm not sure how I feel about this more brown one yet. 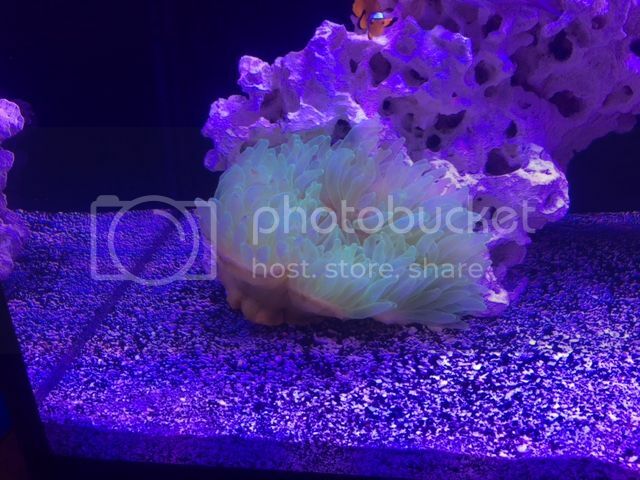 This is my new green bubble anemone. 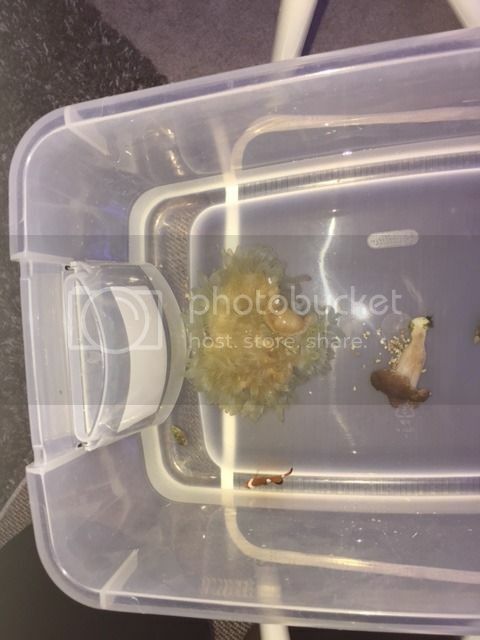 like I said in the earlier post, the anemone is in the process of splitting. I am trading the other half with a friend for a Duncan frag. One thing I have read about bubble anemones is they move a lot. hopefully it finds a secure home. I am most excited about this purchase. I went to the store knowing I didn't want a basic a clownfish so I wanted to get something a little different. I got pretty lucky with this fish. This fish was actually in one of the display tanks at aquatica with a lot of rock work so the worker had one chance to get the fish. sure enough he got em.